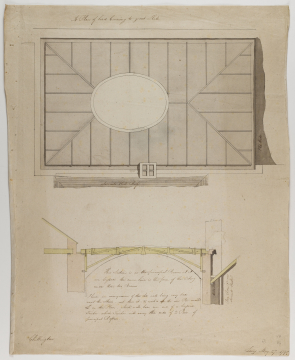 David Laing (1774-1856) signed this copy of a drawing, made barely five months after he began his pupilage, which was not the usual practice within Soane's office. The 'I' of the note about working up 'the new Pier' came from the carpenter'. Laing's entry in H. Colvin, Biographical dictionary of British architects 1600-1840, 2008, shows that he was the son of a 'cork cutter' of Tower Street, London. After completing his articles, Laing set up in practice for himself and was doing very well, designing the London Custom House in 1817 with 'an elegant neo-classical design of considerable merit'. Unfortunately, through either gross incompetence or collusion, part of the facade collapsed in 1825 and Laing 'had difficulty obtaining any further commissions'.